Insects have a spatial orientation memory that helps them remember the location of their destination if they are briefly deflected from their route. Researchers at Johannes Gutenberg University Mainz (JGU) have examined how this working memory functions on the biochemical level in the case of Drosophila melanogaster. They have identified two gaseous messenger substances that play an important role in signal transmission in the nerve cells, i.e., nitric oxide and hydrogen sulfide. The short-term working memory is stored with the help of the messenger substances in a small group of ring-shaped neurons in the ellipsoid body in the central brain of Drosophila. Flies form a memory of locations they are heading for. This memory is retained for approximately four seconds. This means that if a fly, for instance, deviates from its route for about a second, it can still return to its original direction of travel. "This recall function represents the key that enables us to investigate the biochemistry of working memory," said Professor Roland Strauss of JGU's Institute of Developmental Biology and Neurobiology. The researchers are particularly interested in learning how a network in an insect's brain can build such an orientation memory and how exactly the related biochemical processes function. Working on her doctoral thesis, Dr. Sara Kuntz found to her surprise that there are two gaseous neurotransmitters that are involved in information transmission. These gaseous messenger substances do not follow the normal route of signal transmission via the synaptic cleft but can diffuse directly across the membrane of neighboring nerve cells without docking to receptors. It was already known that, for the purposes of memory formation, nitric oxide (NO) is essential for the feedback of information between two nerve cells. What has now emerged is that NO also acts as a secondary messenger substance in connection with the amplification of the output signals of neurons. This function of nitric oxide can apparently also be assumed by hydrogen sulfide (H2S). Although researchers were aware that this gas plays a role in the control of blood pressure, they had no idea that it had another function in the nervous system. "It has long been assumed that hydrogen sulfide was harmful to the nervous system. But the results of our research show that it is also of importance as a secondary messenger substance," explained Strauss. "We were absolutely astonished to discover that there are two gaseous neurotransmitters that are important to memory." Strauss and his colleagues postulate that both neurotransmitters together with cyclic guanosine monophosphate (cGMP) form the perfect storage media for short-term memories. They presume the process functions as follows: The fruit fly sees an orientation point and moves in its direction, at which point nitric oxide is formed. The nitric oxide stimulates an enzyme that then synthesizes cGMP. Either the nitric oxide itself or cGMP accumulate in a segment of the doughnut-shaped ellipsoid body that corresponds to the original direction taken by the fly. The ellipsoid body is located in the central complex of the insect brain and is divided into 16 segments, rather like slices of cake, each of which represents a particular spatial orientation. Given that a Drosophila fly deviates from its path because it loses sight of its initial orientation point and temporarily becomes aware of another, that fly is then able to get back on its original course because a relatively large quantity of NO or cGMP has accumulated in the corresponding ellipsoid body segment. However, all of this only functions under one condition. The memory is only called up if the fly does not see anything in the interim, the fly must also lose sight of the second orientation point. "The recall function only becomes relevant when there is nothing more to see and readily acts as an orientation aid for periods of up to four seconds," explained Dr. Sara Kuntz, primary author of the study, adding that this seemingly short time span of four seconds is perfectly adequate to enable a fly to deal with such a problem. "The ellipsoid body retains the backup copy to span any such brief interruptions." There is no point in having a working memory with a longer duration as objects that have been selected as orientation points are not necessarily anchored in place but may themselves also move. 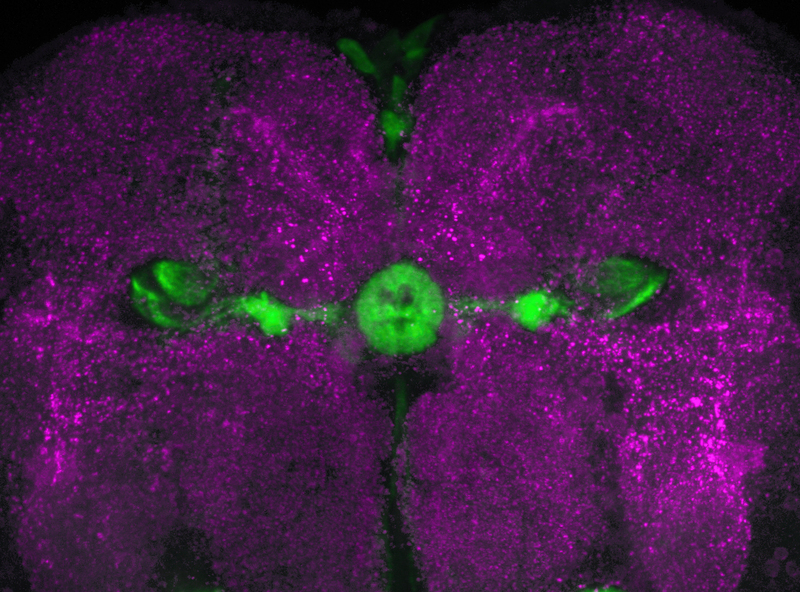 A small group of ring-shaped neurons (green) in the central brain of the fly (magenta) are the seat of visual orientation memory. 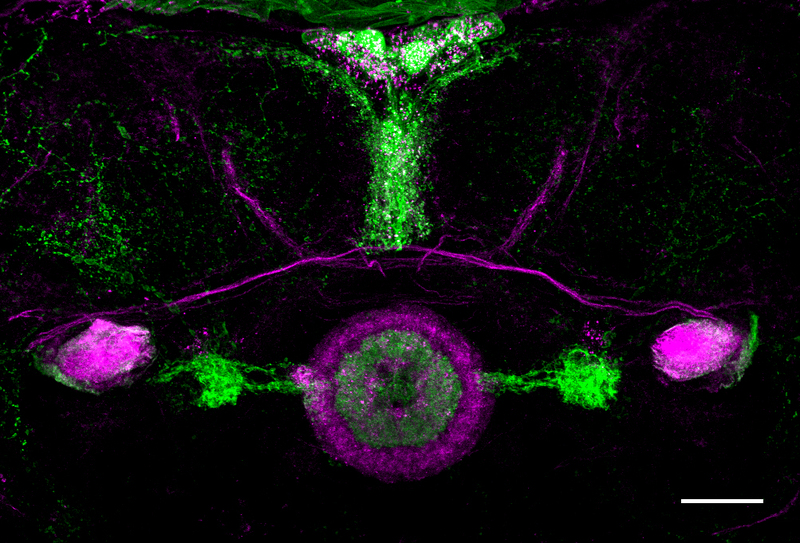 A small group of ring-shaped neurons (green) in the ellipsoid body of the fly (magenta in the center of the image) are the seat of visual orientation memory. The scale bar shown at the bottom right of the image is equivalent to 25 µm in length.